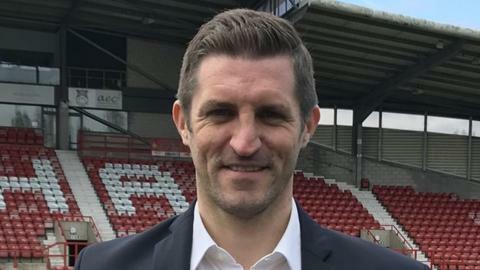 Birmingham City manager Garry Monk believes former housemate Sam Ricketts can do an "excellent job" at Wrexham. Ex-Wales defender Ricketts has been appointed on a three-year deal, his first managerial role. Monk, a team-mate of Ricketts at Swansea City between 2004 and 2006, says the 36-year-old has the qualities to succeed as a manager. "I've said to him 'if you need any help or support I'll give it you' not that he's going to need it," said Monk. "He's a smart guy and will be very planned and organised and will work diligently. "I wish him all the best, he's a very good friend of mine." Wrexham, relegated from the Football League in 2008, missed out on the 2017-18 season National League play-offs by three points. Former Bolton Wanderers and Hull City player Ricketts has been working on his coaching qualifications with the Football Association of Wales after being forced to retire from playing in 2016. He left his role with Premier League-bound Wolverhampton Wanderers' youth set-up to succeed Dean Keates at the Racecourse Ground in May 2018. "You have to throw yourself in there and you'll never know until you're actually doing it," added Monk, who has also managed Swansea, Leeds United and Middlesbrough. "He's put himself in that line and I say all credit to him. It takes a certain type of character to put yourself on the line. "It's a really great appointment by Wrexham - that they've given someone like Sam an opportunity. "He'll need support, like any manager. "We live in an instant world so it's high pressure but if he's given the time and the right support then he'll do an excellent job."